We want to make it easy for you to manage your organization’s data security. A big part of this is making sure you and your admins can access a bird’s eye view of your security—and, more importantly, that you can take action based on timely insights. Today, we’re introducing the security center for G Suite, a tool that brings together security analytics, actionable insights and best practice recommendations from Google to empower you to protect your organization, data and users. 1. See a snapshot of important security metrics in one place. 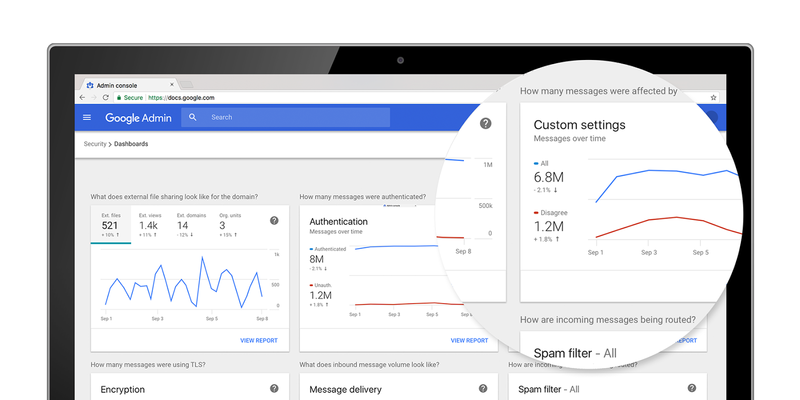 Get insights into suspicious device activity, visibility into how spam and malware are targeting users within your organization and metrics to demonstrate security effectiveness—all in a unified dashboard. 2. Stay ahead of potential threats. 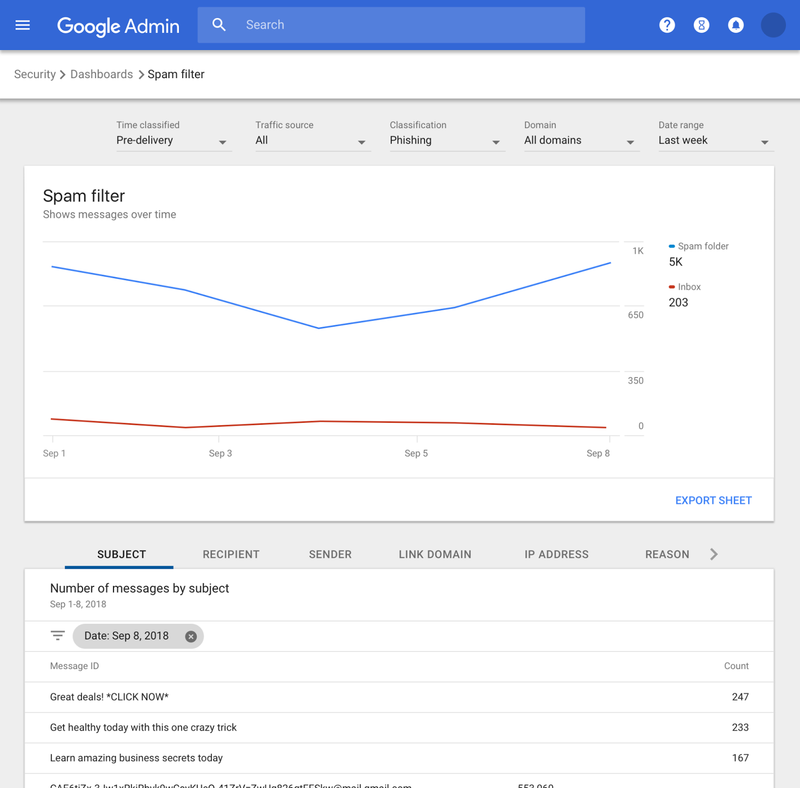 Admins can now examine security analytics to flag threats. For example, your team can have visibility into which users are being targeted by phishing so that you can head off potential attacks, or when Google Drive files trigger DLP rules, you have a heads up to avoid risking data exfiltration. 3. Reduce risk by adopting security health recommendations. Security health analyzes your existing security posture and gives you customized advice to secure your users and data. These recommendations cover issues ranging from how your data is stored, to how your files are shared, as well as recommendations on mobility and communications settings. More than 3.5 million organizations rely on G Suite to collaborate securely. If you’re a G Suite Enterprise customer, you’ll be able to access the security center within the Admin console automatically in the next few days. 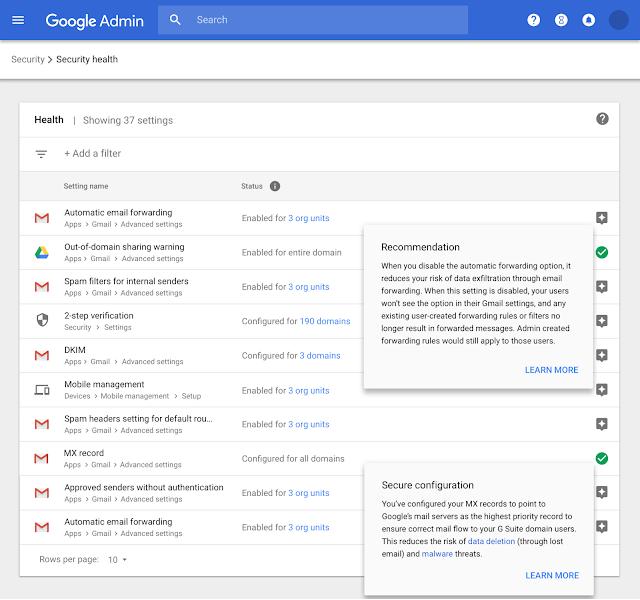 These instructions can help admins get started and here are some security best practices to keep in mind. If you’re new to G Suite, learn more about about how you can collaborate, store and communicate securely.